Fairmont Hot Springs is a year-round resort village situated south of the community of Invermere, BC, Canada in the Columbia Valley, Kootenay region of British Columbia. 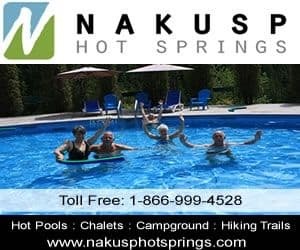 The popular recreation destination includes the largest odourless hot spring pools in Canada! Excited to be here in Fairmont Hot Springs BC! Activities most enjoyed in Fairmont Hot Springs and the surrounding areas include hiking, golfing, mountain biking, downhill skiing, cycling, downhill skiing, snowboarding and xc skiing. A few of the more popular activity and sightseeing park and trail destinations located in Fairmont Hot Springs, British Columbia and the surrounding areas includes the hot springs, and Fairmont Ski Hill. Travel services important to travelers in and around the community of Fairmont Hot Springs, BC includes accommodations (hotel, motel, inns, vacation homes, cottages, resorts, lodges, bed and breakfast, rental suites), pub, restaurant, gas station, liquor store, convenience store, coffee shop, cell service, internet and Fairmont Hot Springs Airport. Explore Fairmont Hot Springs, British Columbia, Canada Travel Guide for Accommodations, Attractions and Adventure. eh! Plan to Visit Fairmont Hot Springs in British Columbia.